How Will My Business Benefit From Digital Signage? 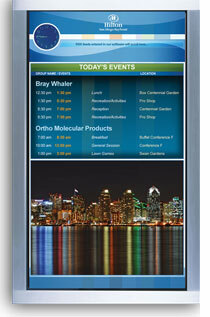 Effectively and dynamically sell your services with state-of-the-art menu boards, daily specials, promotions and messages. Give your advertising and marketing message a boost with exciting dynamic digital signage. Digital signage, also known as Digital Out Of Home (DOOH), is a media solution that uses digital display technology such as LCD, Plasma, and LED displays to communicate with a target audience. This cutting edge, professional advertising tool can reduce printing costs and turnaround times to get your message out. Digital Signage can be interactive or dynamic. Dynamic digital signage delivers relevant, useful information in a format users find attractive and inviting. From menu boards to custom video content, digital signage can give you unlimited flexibility. This exciting new media can be used in waiting rooms, restaurants, lobbies and health clubs — anywhere customers need to be informed or entertained. Digital signage is easy to use, easy to implement, effective and interactive. Our expert team will help you determine which display and type of signal delivery is best for your business. Then we’ll install it and provide you with the proper training to maximize your investment.